2. I always have to watch the ending credits of movies if I like the music. 3. Slugs give me the heebee-jeebees…but where do I live? In Slugville, USA. 4. I don’t like cream pies or whipped cream–it’s a texture thing. I don’t care too much for marshmallows either. Sounds like a white thing but it’s not because I can eat most treats coated in powdered sugar. 5. I’m a fitness junkie. Art of Strength Providence is one of my favorite kettlebell workouts. Check out a clip here. I also used to be a Turbo Kick certified instructor. 6. I was in London when Prince William was born and cheered the royal family when they returned to Kensington Gardens after his christening. 7. I have orbs in my house that only show up on camera shots…shudder…but otherwise all is normal. 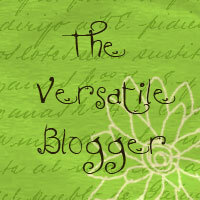 And a great big THANK-YOU to Ellen for passing on this blog award to me. Check out her blog too while you’re at it here.